My dad was born 71 years ago this coming Saturday. Many of you who will read this knew my dad. He was beloved by many. Dad had a great sense of humor, was charismatic, friendly, personable and a caring man who was a good family man, friend and was active in the community. And, my dad had an active faith life. He was a practicing Catholic and believed in God, Jesus Christ, the Holy Spirit, and the beliefs of the Catholic faith. He went to Catholic grade school and high school. He had an active prayer life that involved weekly and holiday attendance at church, and daily prayer, including the rosary. Many times growing up I would find my dad sitting in the basement quietly, alone, holding his rosary and praying. 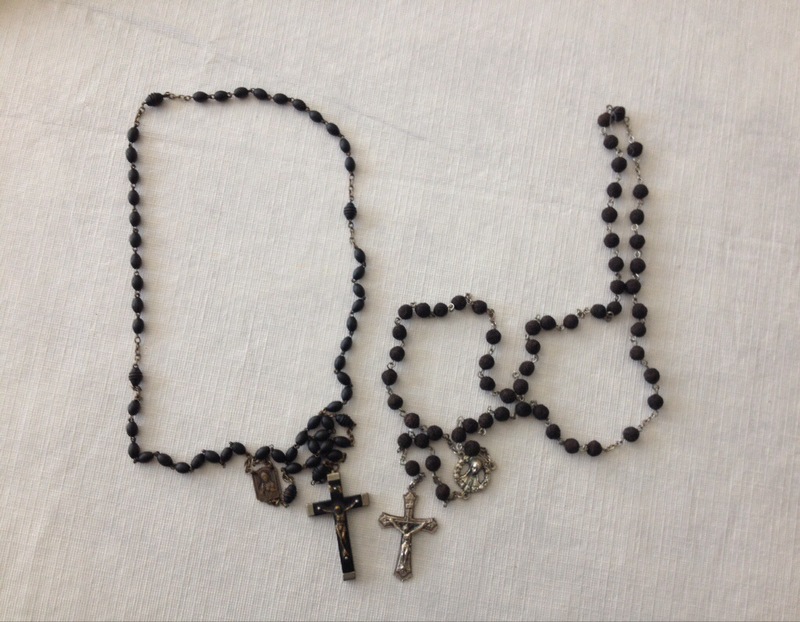 Pictured below are two rosaries….the one on the left was my dad’s….the one on the right was one my mom had made for me from the roses from my dad’s funeral. I still have them both. You can click on the photo to see a larger version for greater detail. I share this as many of you loved my dad, and he loved many of you and he would have wanted to draw as many of you to The Lord as possible. And he can still do that posthumously by the good life he lived and the good memories of him he left behind. This coming Saturday’s 8:30am morning mass at St. Christopher in Midlothian, IL is offered in special intention for my dad. My mom and I will be attending that mass and going out to breakfast at Keystone Café afterward. Why not join us for mass to celebrate dad’s life, to pray for him, and then join us for breakfast afterward? Maybe I will see some of you there. 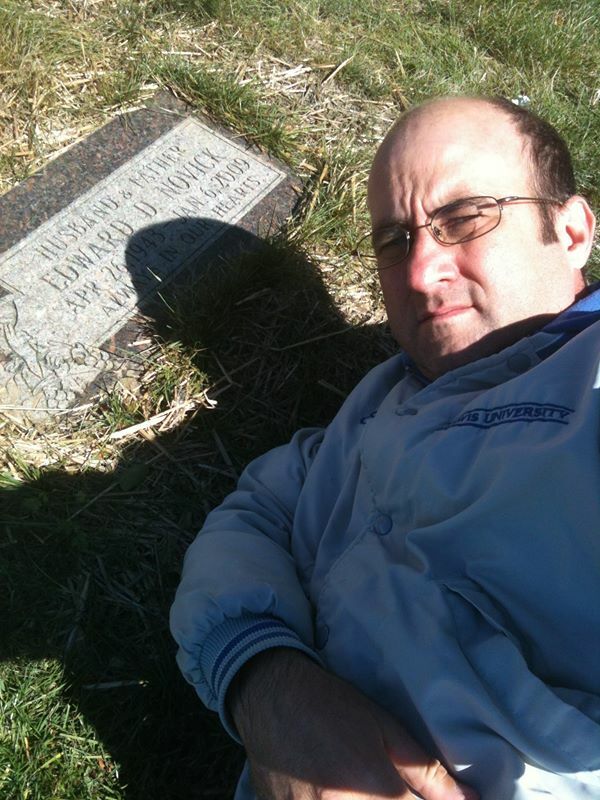 This past weekend on Easter afternoon I went to Holy Sepulchre cemetery (between 111th and 115th between Central and Ridgeland in Alsip, IL) to where my dad is buried to pay respects and say a prayer for him. It was a beautiful Easter Day. The sun was shining and it was warm with temperatures in the 70’s. It was a stark contrast to cold, painful and lonely days of the past at the cemetery. Here is a photo from the gravesite I took one such day a year and a half ago. I still sense a close connection with my dad from beyond even though he passed away over 5 years ago. I often think back to the time when my dad was dying and yet worried about me and the crosses I was bearing painfully in life at the time. He was dying, but he was worried about me. That was how he was. I remember promising him I would be OK. I thought a dying man needed to know that his children would be OK after he died. I know I needed to believe that I would be. And I needed to keep that promises to my dad – so I endured. Dad was always there for me in life. And I imagine dad is still watching out for me from his eternal home with The Lord. It sure felt that way as I stood graveside on this sunny Easter day and sensed the presence of an angel.